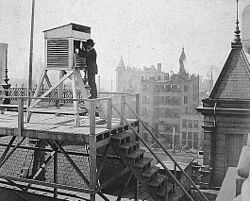 Weather observations being taken in Minneapolis, Minnesota in 1890. The 1936 North American heat wave caused record-setting temperatures in eight US states. 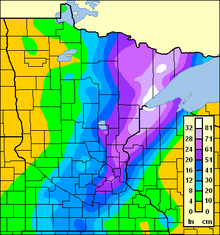 Map of Minnesota showing the snowfall totals from the 1991 Halloween Blizzard. Damage from the 1886 Sauk Rapids tornado, Minnesota's deadliest tornado on record. ^ a b c d Seeley W., Mark (2006). Minnesota Weather Almanac. Minnesota Historical Society press. ISBN 0-87351-554-4. ^ "History of the NWS in the Twin Cities". National Weather Service - Twin Cities. November 9, 2005. Retrieved 2007-06-19. ^ a b c d e "Climate Extremes for Minnesota". Minnesota Climatology Office. September 6, 2011. Archived from the original on October 5, 2006. Retrieved 2012-03-12. ^ "New 24-hour precipitation record established in Minnesota". National Weather Service. August 23, 2007. Retrieved 2007-08-24. ^ "Monthly Minnesota Rainfall Record Broken". Minnesota Climatology Office. October 18, 2007. Archived from the original on May 14, 2008. Retrieved 2007-10-19. ^ a b "Minnesota Snowfall and Snow Depth Extremes". National Climatic Data Center. December 3, 2007. Retrieved 2008-02-01. ^ "Famous Minnesota Winter Storms". Minnesota State Climatology Office. March 2, 2007. Archived from the original on January 7, 2009. Retrieved 2007-06-28. ^ "Minnesota Tornado History and Statistics". Minnesota Climatology Office. May 21, 2007. Archived from the original on August 11, 2007. Retrieved 2007-06-19. ^ "Summary of March 06 2017 Severe Weather Outbreak". National Weather Service - Twin Cities. March 7, 2017. ^ "F5 Tornadoes of the United States". Storm Prediction Center. ^ a b "How Historically Unusual Was This?". The Southern Minnesota Tornadoes of March 29, 1998. NWS - Twin Cities. March 6, 2008. Retrieved 2008-05-08. ^ "NCDC Storm Event Database". NCDC. 1950–2006. Retrieved 2007-06-24. ^ Macek-Rowland, K.M. (April 13, 2005). "1997 Floods in the Red River of the North and Missouri River Basins in North Dakota and Western Minnesota". U.S. Geological Survey. Retrieved 2007-07-11. ^ a b "Historic Rainfall and Flooding Event of August 18-20, 2007". NOAA. Retrieved 2007-08-31. ^ "RED RIVER OF THE NORTH AT FARGO, ND". U.S. Geological Survey. Retrieved 2009-06-18. ^ "RED RIVER OF THE NORTH AT GRAND FORKS, ND" (PDF). U.S. Geological Survey. Archived from the original (pdf) on 2007-12-03. Retrieved 2007-07-20. ^ "MINNESOTA RIVER NEAR MONTEVIDEO, MN" (PDF). U.S. Geological Survey. Archived from the original (pdf) on 2007-12-03. Retrieved 2007-07-20. ^ "MINNESOTA RIVER NEAR ALEXANDRIA, MN" (PDF). U.S. Geological Survey. Archived from the original (pdf) on 2007-12-03. Retrieved 2007-07-20. ^ "MISSISSIPPI RIVER AT ST. PAUL, MN" (PDF). U.S. Geological Survey. Archived from the original (pdf) on 2007-12-03. Retrieved 2007-07-20. ^ "MISSISSIPPI RIVER AT WINONA, MN" (PDF). U.S. Geological Survey. Archived from the original (pdf) on 2007-12-03. Retrieved 2007-07-20. ^ "Storm Data and Unusual Weather Phenomena" (PDF). NOAA. Retrieved 2006-11-20. ^ "Record Low Pressure Hits Minnesota October 26-27, 2010". Minnesota Climatology Office. October 28, 2010. Archived from the original on October 31, 2010. Retrieved 2010-10-29.